Dunton Bassett is a village in south-west Leicestershire, near the town of Lutterworth. In 1676 among a population of 119 people who were old enough to take communion at the parish church, 11 were said to be nonconformists. By 1706, there were said to be just five dissenters in the parish: three men described as ‘Anabaptists’ and two women who were ‘Presbyterians or Independents’. There was no meeting house in the parish. A meeting place was established in 1785 at the home of a dissenter, although the denomination is not known. There is no evidence of non-conformity in the village at the time of the 1829 Return of Religious Meeting Places. White’s Directory of 1846 records the existence of a ‘small thatched’ Independent Chapel, erected in 1837. 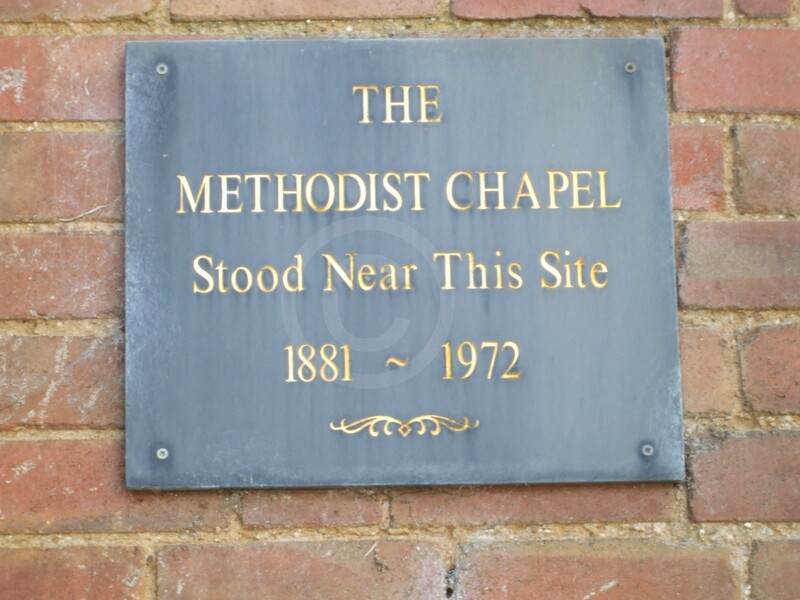 By 1863, this chapel was being used by Primitive Methodists, the only denomination listed as meeting in the village. The 1851 Religious Census notes the chapel as being built in 1840. It contained 135 sittings, only 20 of which were free, as well as 20 standing spaces. On census day, services were held in the afternoon and evening, with congregations of 35 and 73 respectively. Average attendances in the chapel were said to be 10 in the morning and 20 in the evening. No figure was provided for average Sunday School attendance, but on census day 12 people went to the single Sunday School session, held in the morning. Later sources confirm the continued presence of Primitive Methodists into the 20th century. A new chapel was erected in 1880, which contained 200 sittings in 1916. 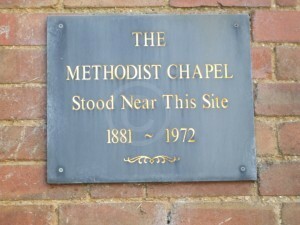 The chapel was demolished in 1972, but a plaque erected near the spot where it stood (above). J. Broad (ed. ), Bishop Wake’s summary of visitation returns from the diocese of Lincoln, 1706-1715. Part 2, Outside Lincolnshire (Huntingdonshire, Hertfordshire, Bedfordshire, Leicestershire, Buckinghamshire) (Oxford, 2012), p. 846. Leicestershire and Rutland County Record Office (ROLLR), record of meeting places in Leicestershire, QS 44/1/2. White, Hist. Gaz. & Dir. Leics. (Sheffield, 1846) p. 256. White, Hist. Gaz. & Dir. Leics. (Sheffield, 1863) p. 740. Religious Census of England and Wales (1851), entry for Dunton Bassett, HO 129/408/19. Kelly’s Dir. (1881) p. 515; Kelly’s Dir. (1916) p. 73.